Sports news site The Post Game recently included former Augsburg College basketball player and legendary coach Lute Olson ’56 in an article about notable athletes from North Dakota. Olson was born and raised near the Minnesota-North Dakota border before attending Augsburg. After graduating, he went on to become the head coach of the University of Arizona men’s basketball team. As the article points out, Olson’s teams made it to the Final Four a total of five times, winning the national title in 1997. Read 9 Notable Athletes From North Dakota: Carson Wentz, Phil Jackson And More on the Post Game site. The Minneapolis Star Tribune recently interviewed former Augsburg College basketball player and retired NBA star Devean George ’99 about the upcoming retirement of legendary Los Angeles Lakers player Kobe Bryant. George, who retired in 2011, played his first seven seasons in the NBA alongside Bryant. Read George: When it’s time, it’s time on the Star Tribune site. The Minnesota Daily recently covered the Cedar Riverside Community Traveling Basketball program, which provides coaching, practice, and competition for six teams of local boys and girls ranging from sixth to 10th grade. Another need Weber recognized dealt with a lack of functional athletic attire that was culturally acceptable for the many Muslim girls in the program. Luckily, design students from the University of Minnesota had already been working to solve that problem. Working with the players and other partners, the students designed uniforms with adjustable hijabs, knee-length skirts and breathable leggings. A grant from the Minnesota Agricultural Experiment Station provided funding to donate the completed uniforms to the program. The article concludes with a statement from coach and co-founder Muna Mohamed ’16, an exercise science senior at Augsburg who grew up in the neighborhood. Legendary Minnesota athlete and coach Stan Nelson ’43 will add another honor to his career, having earned the Bud Grant Distinguished Minnesotan Award from the National Football Foundation. The award, named after the former Minnesota Vikings coach, will be given at the ninth Minnesota Football Honors event April 17. Nelson had a successful athletic career at Augsburg College, having earned letters in football, golf, baseball, and basketball. 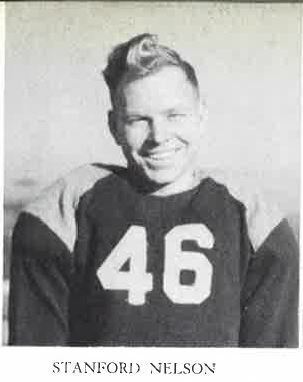 In 1942, he served as the football team captain and was named all-MIAC. After graduating from Augsburg, he earned a master’s degree from the University of Minnesota and began a career as a coach. He held coaching positions in Zumbrota, Farmington, and Anoka, where he coached for 26 years. Read Award in honor of Bud Grant to go to Anoka legendary coach on the ABC Newspapers site. KARE 11 news staff recently interviewed former NBA player Devean George ’99 about The Commons at Penn Avenue, a mixed-use building development in north Minneapolis that George has been working on for four years. The building includes upscale low-income housing and will be the site of a co-op grocery store that will open this summer. George compared the complexity of completing the project with the effort required to join the NBA. Watch and read Retired NBA players builds housing complex in north Minneapolis on the KARE 11 site. If you want to catch some of your favorite Auggie athletes during the winter break, check out their upcoming schedules below (home games bold). For complete schedules, results, live audio, and more, see the Athletics website. St. Olaf College — Jan. 3, 3 p.m.
at Concordia College-Moorhead — Jan. 5, 7:45 p.m.
St. John’s University — Jan. 7, 7:30 p.m.
Macalester College — Jan. 10, 3 p.m.
St. Olaf College — Jan. 3, 1 p.m.
at Concordia College-Moorhead — Jan. 5, 5:45 p.m.
at College of St. Benedict — Jan. 7, 7:30 p.m.